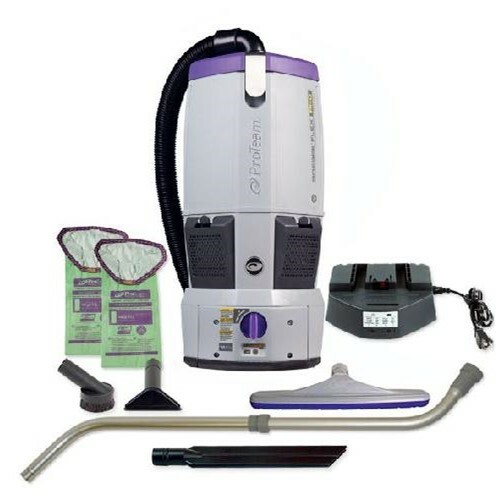 When ProTeam introduced the backpack vacuum, Cleaning and Maintenance experienced a giant step forward in ease of use and productivity. Quality of work increased, productivity increased, and most importantly the operator felt valued as a key team member. 14" dual motor upright, = 18.5 minutes. 14" single motor upright, = 21 minutes. Backpack vacuum, 14" tool = 8.1 minutes. The NEXT GENERATION is here. ProTeam has perfected the battery operation, and is producing a great backpack vacuum with no cord, hence "Go Free". Ask yourself, when was the last time you used a corded drill? This is GAME CHANGING! Working without restrictions means going wherever you need to go to get the job done. ProTeam adds comfort to cordless in our most powerful battery-powered backpack vacuum ever. Go anywhere + 30% increase in backpack productivity by eliminating the restriction of a cord and cord management tasks. Longer Runtime - 12Ah offers approximately 75 mins. of runtime for greater efficiency. Fast Charge - Battery reaches full charge in approx. 2.5 -3 hours so you can get up and GoFree. Weight: 18lbs. / 8.2 kg. Quiet: 63.7dba (about the sound level of a conversation). 2 years motor, battery and charger. 3 years parts and labor on vacuum. Limited lifetime on molded body parts. Each Model Contains: GoFree Flex Pro 6qt Cordless Vacuum, 12Ah Battery, Battery Charger, 5" Upholstery Tool, 3" Dust Brush, 17" Crevice Tool.